Project Type: PLAY! is a visual platform for social curation of multimedia content. We aim to disrupt the way people discover new ideas, share information, and collaborate. Social media is shaking up education. As schools shift from traditional systems of teaching, student engagement, and professional development, the norms for education are changing. How do individuals best learn and communicate through visual media? How do you improve the quality of teaching by pulling in diverse resources and perspectives that are typically overlooked? How do you build enthusiasm and alignment behind these new models of teaching? 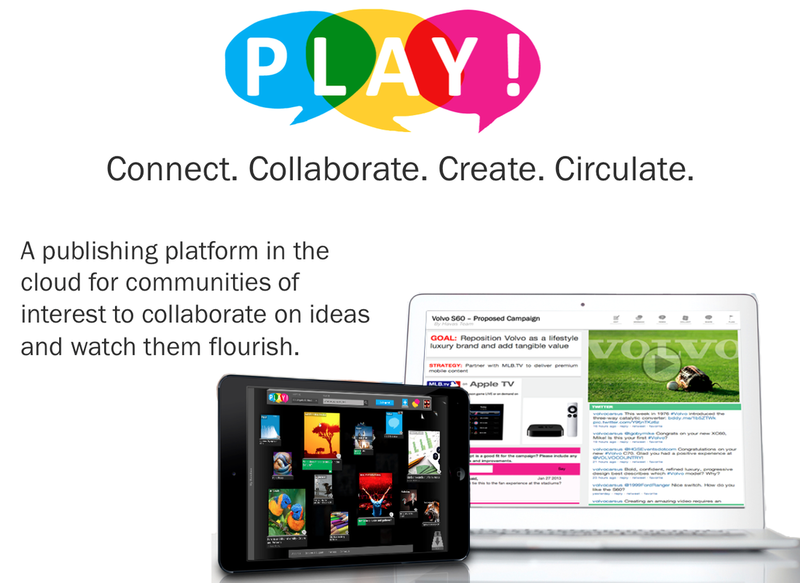 PLAY is an educational collaboration platform helping students and teachers tap into broad interest‑based peer networks – encouraging creativity, connection, and collaboration. With PLAY, people curate emotive crowdsourced multimedia content, stimulating peers to create, circulate, and interact through new media. People organize interest groups drawing inspiration beyond traditional social circles. PLAY is inherently visual, complete with proprietary analytics to identify and boost participation. Social media is a rapidly growing segment of IT spending both among schools and among enterprises in general. IBIS (2012) estimates that collaboration software spending already represents 12% of the $26bn business analytics and software market. IDC (2012) further reports healthy demand for collaboration software connecting internal and external teaching constituencies – an underserved need in the education market. We are concentrating our efforts on disrupting the education market. We tested an early prototype of PLAY with 250 students and teachers in the Los Angeles area, and are looking to expand these efforts. We are looking for a flagship partnership providing expanded access to teachers and providing a scalable distribution gateway into schools and classrooms worldwide. PLAY is a SAAS-based platform with a freemium revenue model. Everyone will have access to a certain level of free services. After which, we will charge access fees for private networks, custom branding, and core network analytics. We also expect strategic partnerships to lead to further revenue, as we will engage in integration, customization, content development, and training activities as a means to ensure customer success and to develop opportunities for follow-on sales. E. Shaw, M. La, R. Phillips, and E. Reilly, “PLAY Minecraft! Assessing Secondary Engineering Education using Game Challenges within a Participatory Learning Environment,” in Proceedings of the 2014 ASEE Annual Conference, Indianapolis, IN, June 2014, Session W447.